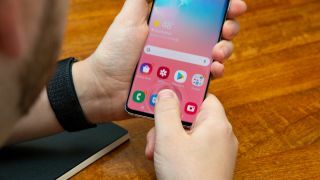 The in-display fingerprint scanner in the Samsung Galaxy S10 and Galaxy S10 Plus is getting better thanks to a new update being rolled out to the handsets. Users have raised concerns about the speed of the ultrasonic fingerprint scanner, with some feeling it leaves them waiting a little too long before unlocking their device. We did notice that the recognition and unlock speeds were a little slower compared to more traditional fingerprint scanners (ones not baked into a display) during our in-depth reviews of the handsets, and Samsung is now addressing this. According to a Reddit thread, the software update is 6.9MB in size and is listed as a "Biometrics security patch - fingerprint scanner". While the release notes from Samsung don't give too much away, Reddit users who have received the update on their S10 and S10 Plus handsets are claiming the speed of the fingerprint scanner has been improved. With the update seemingly already rolling out we'd expect it to hit all handsets in the next few weeks, so if you haven't had it yet there shouldn't be too long to wait.